When CPS closed neighborhood schools in the past, the action rarely resulted in substantial academic improvement in the schools left behind. Today, most of these schools are struggling to hold on to students. Catalyst Chicago analyzed the current academic performance of neighborhood schools in areas affected by school closings and found that two-thirds of these schools now are at Level 3, the lowest rating possible on the CPS performance scale. Almost 90 percent are considered underutilized by CPS standards. One example is in North Lawndale, where Frazier Elementary was closed and its building reopened to co-locate a charter and a magnet school. The students in Frazier’s attendance boundary were assigned to Henson. At Henson, a dismal 41 percent of students were meeting or exceeding standards in 2012. The district average is 76 percent. Citywide, only five of the neighborhood schools created in previous rounds of school closings are highly rated. One of them is Morton Elementary School, a turnaround school managed by the Academy for Urban School Leadership. In addition to a mostly new faculty and staff, turnaround schools also get a substantial infusion of extra cash. Three of the four higher-rated schools are in North Side, middle-class neighborhoods. One of them, Nettelhorst Elementary in Lakeview, was revived by local parents. Ald. Bob Fioretti (2nd Ward) whose ward has the most magnet and selective enrollment schools, says that residents long for neighborhood schools. 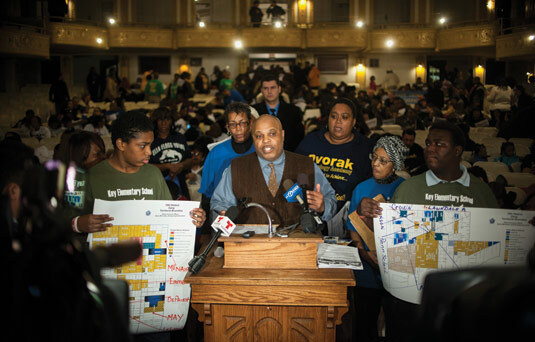 In the gentrifying West and South Loop communities he represents, residents have repeatedly clamored for schools that they could count on for their children. Yet, even as Fioretti has been successful in bringing more school options into his communities, the neighborhoods still don’t have a neighborhood school to lure in new residents with the promise of a good public education for their children. “It is CPS’ custom and practice not to fund neighborhood schools to the degree it is necessary,” Fioretti says. Despite the clamor for good neighborhood schools, some of these schools have found it difficult to attract new students. Alison Beaulieu, a teacher at Dett Elementary on the Near West Side, recalls that Dett has taken in students from Suder and Dodge. But after the Henry Horner public housing projects were demolished and a nearby homeless shelter was relocated, Dett’s enrollment fell and is now just 204. Beaulieu notes that despite new housing and more diversity in the neighborhood, the school is still all-black and low-income. Dett was given the highest rating by CPS until this year, when it fell to Level 2.